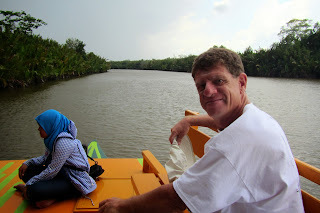 It was hard not to get impatient as we waited for the boat to take us up to the Tanjung Puting National Park. First light happens at about 0400 and dawn is just before 0500, making it hard to sleep much past 0530. The boat was supposed to pick us up at 0830 but it was closing in on 1000 by the time it showed up. The 20-meter timber boat was expertly maneuvered along side Rutea, it’s single-cylinder diesel engine put-putting slowly as the captain used the river current to his advantage. His docking skills were tested five more times as we picked up the crews of Atea, Inspiration Lady, Equanimity, Hokule’a and Solstice. The boat’s main deck was mostly covered and provided adequate shade from the very hot sun and kept us dry as it rained for most of our first day. Below the main deck was the hold that barely had 4’ of head room and the cooks had to do all their work on their knees or squatting. As we chugged up river, our guides, Joe, and his daughter, Febri, proved to be experts at spotting wildlife and were continuously pointing out crocodiles, monkeys and exotic birds. The water of the Sekonyer River was the color of coffee with too much milk in it and even though it got quite narrow in places, our guides told us it had 10 meters of depth. It was still raining lightly was we stopped at our first station and we questioned our guides as to what kind of gear we should wear. 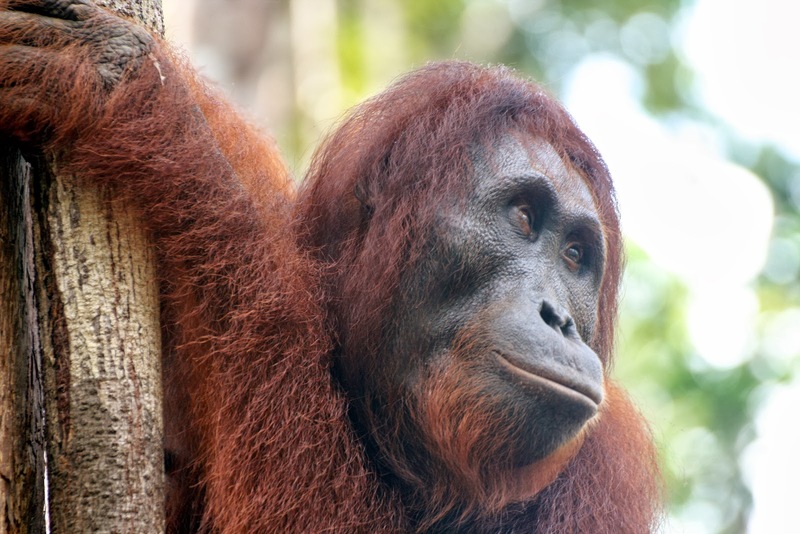 “Will there be any leeches?” “They only come out when its raining.” “How bad will the mosquitoes be?” “Bad.” Undeterred, our 17-person entourage tramped up through the muddy trails in the Borneo rainforest in search of the almost-extinct orangutan. The 415,000-hectare Tanjung Puting National Park is a sanctuary to protect not only the orangutans but also try to keep Borneo’s rainforest from being completely clear cut and transformed into palm tree plantations (for palm oil). 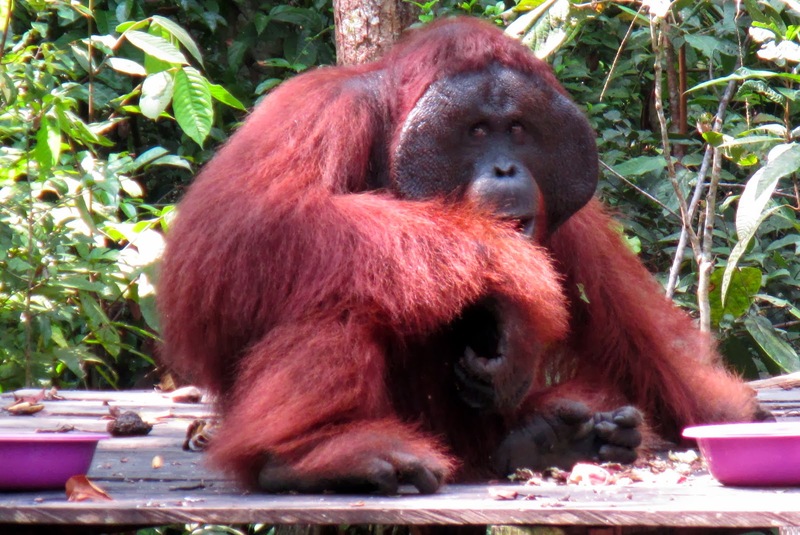 Feeding stations have been set up for orangutans that are being rehabilitated back into the wild, a practice that raises some controversy. Our guide’s timing was perfect and we had no sooner arrived at one such station when one of the park’s staff showed up with a large sack of bananas. 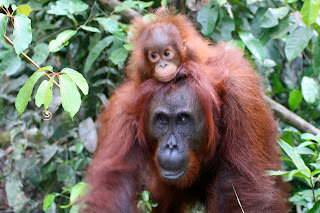 Within a couple of minutes we could hear a major thrashing occurring deep in the jungle and seconds later we could see trees shaking and bending over as the orangutans made their way towards us. 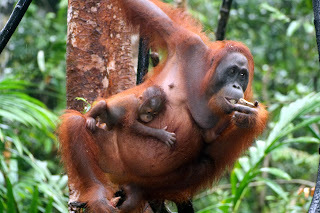 A mother orangutan and her baby were swinging through the trees, climbing to the near tops and as the tree would bend under their weight, the orangutan would simply grab another tree and continue her progress, her baby holding on to her fur. 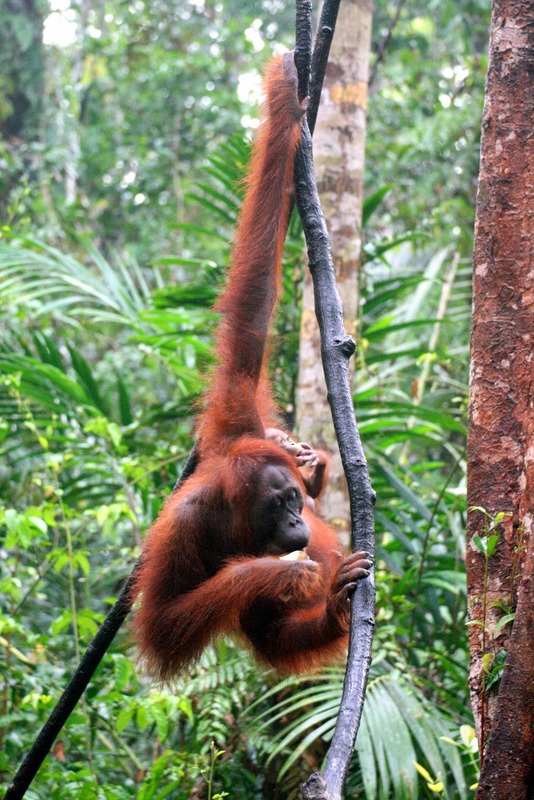 Often a branch would snap under her weight but she continued on, stopping from time to time. Climbing up a tree appeared to be as effortless as climbing down, the strong fingers on their hind legs gripping as well as the fingers on their hands. 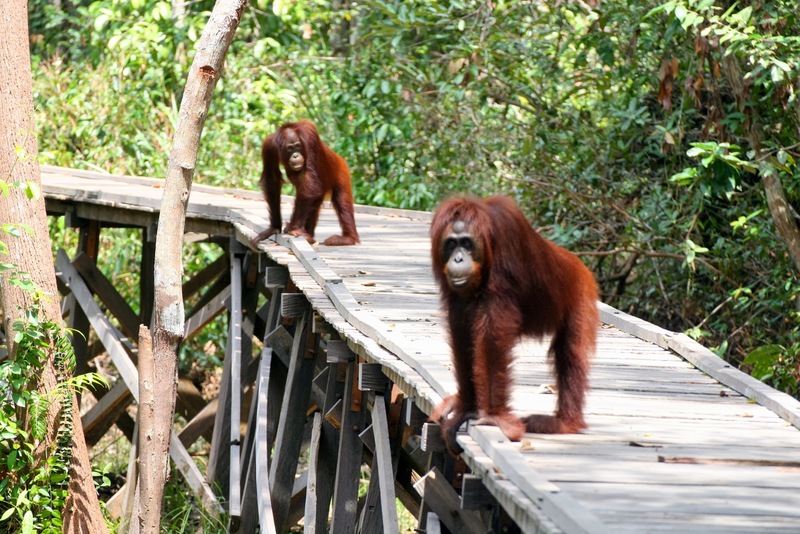 As they reached the feeding platform, you could see how expressive their faces are, even though they’re the least related to humans of all the great apes. 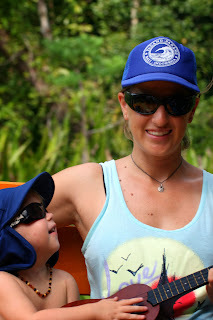 We were pretty well drenched with sweat and rain by the time we got back to the boat but our cameras were loaded with hundreds of precious photos. The cooks brought out a big batch of hot banana fritters as a snack that would hopefully keep our hunger in check until dinner. I was disappointed when dinner was served as not only was there very little to feed the 17 of us but I thought the food had a distinct diesel fuel flavor. After dinner, we cast off again and made our way downstream in the fading light to a spot where fireflies are known to hang out. As dusk turned into night, one tree in particular started glowing with millions of the bugs, sometimes their ‘lights’ blinking in unison. Once we had returne to dock at the station, a big group of us played cards while the enormous bugs were drawn to the fluorescent lights. The crew sat by until we were finished and then cleared the area for sleeping. As the main deck was only big enough for about 6 people to sleep on, two other similarly-sized boats were brought in as sleeping stations. 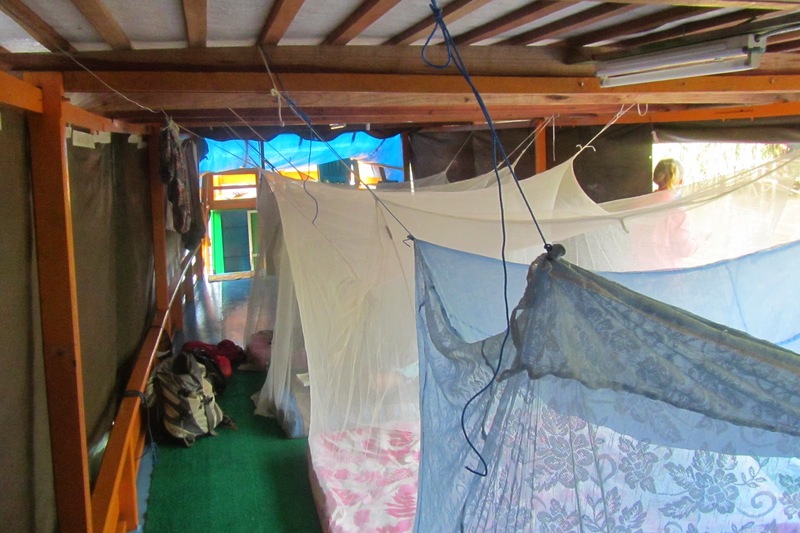 The ‘mattresses’ were like lumpy tumbling mats but the individual mosquito nets promised to keep the malaria-carrying evil critters away if not providing any privacy. It was kind of like a slumber party with Ruthie, Corie, Kyle and I sleeping right next to Jake and Jackie from Hokule’a, separated only by the thin gauze of the mosquito nets. Needless to say, I didn’t get much sleep as one of the crew sleeping below went into a coughing fit that lasted for hours. Breakfast was horrible. They served us scrambled eggs that had been sweetened and slices of white bread with too much melted ‘butter’ on it. The coffee we made ourselves, dumping coffee that had been ground to a fine powder into a cup, pouring boiling water on it, waiting for the grounds to settle and then drinking it while trying to avoid getting a mouth full of grounds. Someone saw the crew being served heaps of nasi goreng, the staple of fried rice and vegetables so we told our guides that that was what we wanted for breakfast the next day. 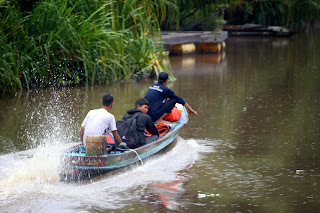 After the main deck was cleared of breakfast and the sleeping gear, we got underway again, making a turn onto the Sangai Sekoner Kecil where the water changed from it’s milky color to that of strong tea. It was much narrower and seemed even more remote as the jungle towered over us. 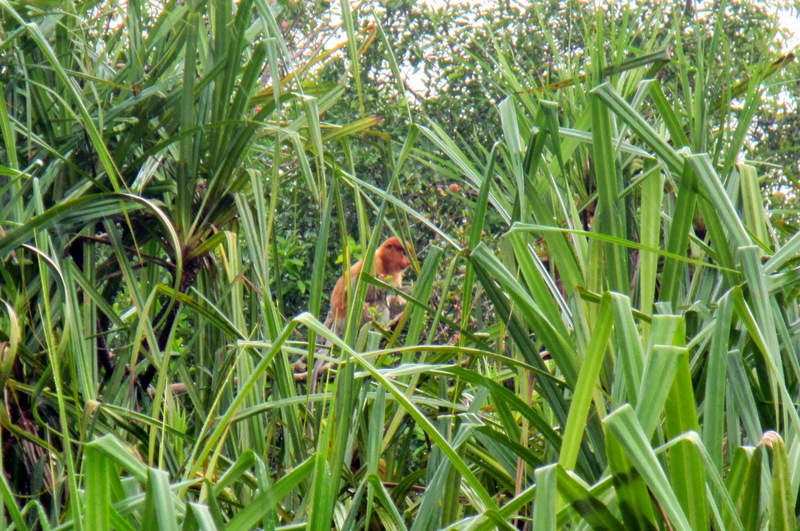 We docked at Camp Leakey, a station named after the famous anthropologist and, almost as if waiting for us, sat a male orangutan, just a few feet away on the other side of the narrow river. Things were becoming congested with other boats bringing tourists to the same spot, with the ‘raft up’ completely blocking any passage upstream. As we were getting ready to make our way to the camp’s center, a crafty orangutan named Percy stealthily made his way onto one of the boats and stole a can of condensed milk off the table, the crew who was sitting only a few feet away oblivious until it was too late. It was a small army of tourists who made their way into the camp that afternoon, dressed in full mosquito battle gear and armed with an expensive collection of long-lensed cameras. As we were walking up the path, following right behind a mother orangutan and her baby, she grabbed the hands of the person to her right and to her left and with a powerful grasp, lifted herself off the ground, choosing to be carried to the feeding station rather than walking. Many of us took turns carrying the 60-kilo ape and her baby; sometimes she would nibble on the hand that was carrying her. This time the feeding station was crowded with orangutans and we were able to see some of the dynamics between their hierarchy. Showers were offered once we were back on the boat and a steady stream of the cool river water provided a welcome respite to the steamy heat. 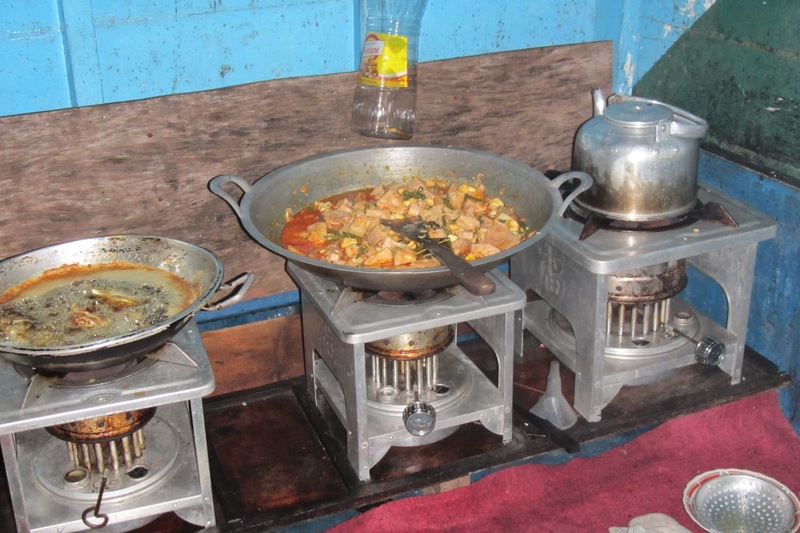 The boat was moved downstream for the night and we had another forgettable dinner. The mattresses were just as uncomfortable as the night before and the nasi goreng in the morning still had the diesel-fuel flavoring. We made our way to still another feeding station although this time dominating the platform was a large adult male which we hadn’t seen before. 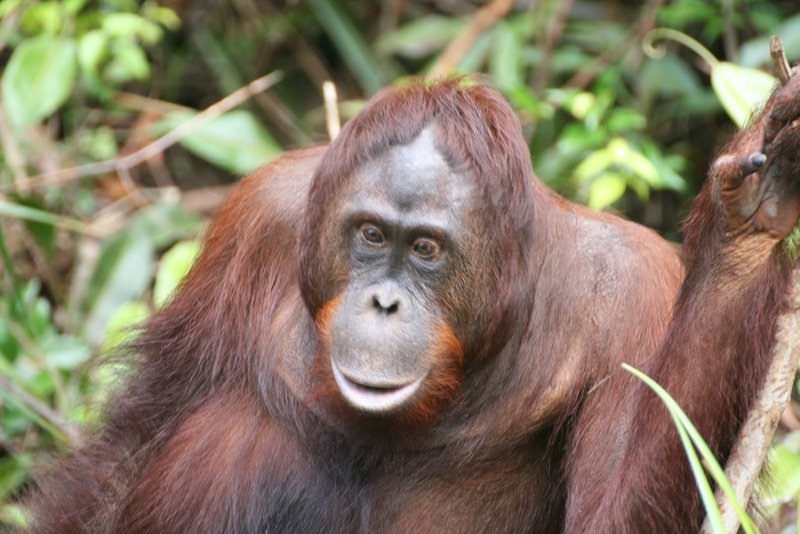 There was no mistaking his wide cheeks, broad shoulders and huge pouch under his chin. After yet another lousy lunch, we began to make our way back to our respective boats. Most of those in our group gushed with enthusiasm for the expedition although I am more reserved. I am absolutely glad I did it but my expectations had been for a few more creature comforts, especially since I found out that we had paid a premium price and I know some of the other boats were better appointed than ours. I suppose that if you’re an anthropologist, watching orangutans eat for hours is fascinating but it started to get boring for me. Now that we’re back aboard Rutea, I am looking forward to getting underway and finding our next adventure. Love the photos. Glad you are enjoying yourselves! 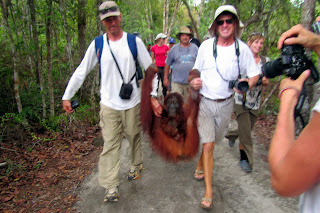 Wow, great awesome trips...loved the Orangutan. missed them as well.